Glenn Greenwald had already proven his civil-libertarian credentials long before becoming the journalist to carry Edward Snowden's revelations of NSA spying against the American public. While self-identifying with the political Left, he has waged a courageous and consistent defense of liberty and peace, and shown willingness to criticize authoritarianism on either side of the political fence. This has earned him the respect of persons of conscience across the political spectrum... and the enmity of the Obama administration. 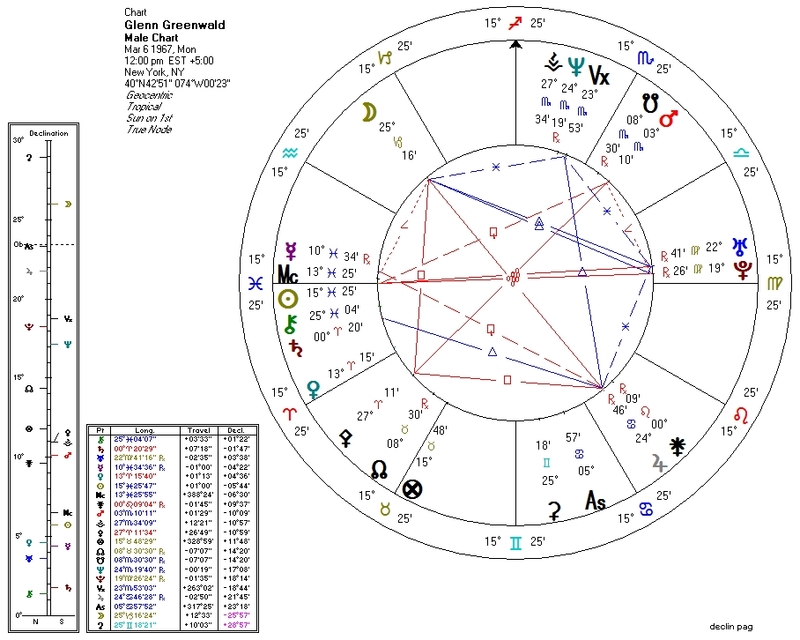 This astrological chart is something of an anomaly among libertarian-leaning charts -- perhaps a time of birth might help clear things up -- but fits the "left-libertarian" profile by a hair. There is a fair number of authoritarian aspects here: Jupiter square Pallas, and Mars (ruler of Pallas) conjunct the South Node and semisquare Pluto. On the libertarian side, Pallas is novile with the Sun and widely conjunct the North Node. I believe it's the wide North Node conjunction that does it: Pallas tolerates wide orbs, and in many cases a North Node conjunction can overwhelm strong authoritarian factors. Greenwald's Leftward lean is a little easier to explain. Mars, ruler of Venus, is conjunct the South Node (economic Leftism); the Moon is ruled by Saturn which is trine Neptune, and very probably the Moon is sextile Neptune (cultural liberalism). Other factors of interest: Sun conjunct Mercury, opposite Pluto and sesquiquadrate Mars: fighting immense power using communication. "Fighting" is underscored by a very probable Moon-Pallas square. A more traditional astrologer might point out Mars conjunct the South Node, indirectly semisquare Uranus, as a gay-male indicator. The late Jack Fertig pointed out that these sorts of indicators are less reliable now with public acceptance of homosexuality (taking sexual preference out of the "weird" universe of Uranus). The Moon is traditionally strong in charts of writers: regardless of birth time, the Moon will be opposite Jupiter in Cancer (ruled by the Moon). We arguably have a grand cardinal cross between Pallas in Aries, Moon in Capricorn, Mars in Scorpio, and Jupiter in Cancer: lifelong battle regarding power, ethics, the public, and the press. Looks like powers-that-be may have picked the wrong guy to piss off.